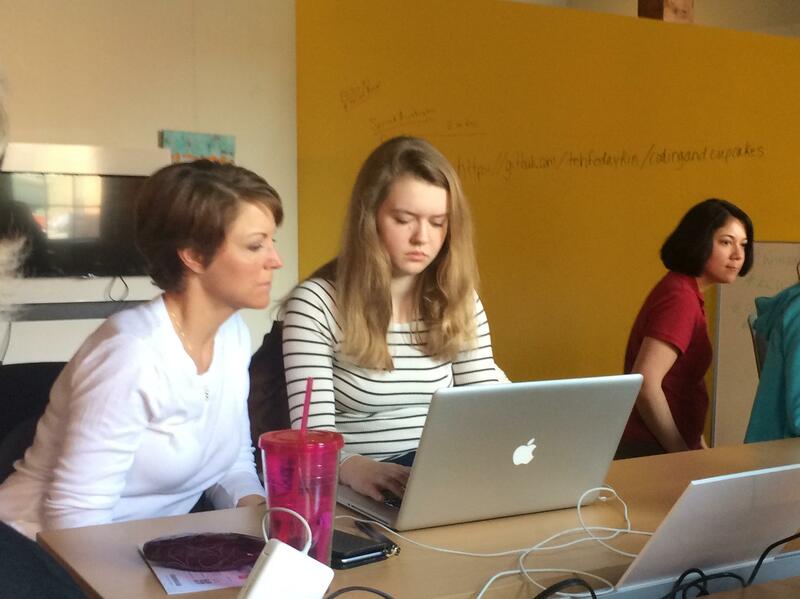 Coding and Cupcakes helps mother-daughter teams learn web design basics. But the moms are told to keep hands off the keyboard, and let their daughters do the work. Coding and Cupcakes is a mother-daughter learn-to-code event put on by a group called Kansas City Women in Tech. By the end of the day, a lot of the girls say they'd consider a job in the tech world when they grow up. "I think it's pretty fun," says Carlgren. "It's a little bit hard for me, but I think I can get better at it." If these girls do decide to pursue tech, they're in the right place. Kansas City was recently ranked the second best city for women in technology by financial data firm SmartAsset. Jennifer Wadella, the founder of Kansas City Women in Tech, isn't surprised. "The community is really supportive in allowing women to grow in that area," says Wadella. "Companies are always asking me, 'How can we be better? What can we do better?'" Wadella thinks that's something you don't find elsewhere. "I think it's definitely something unique to Kansas City." Women make up a third of the tech workforce in Kansas City, much higher than San Francisco's 20 percent. And women actually earn more than men in tech fields here, according to SmartAsset. Considering that women in Silicon Valley earn 87 percent what men earn, that's an accomplishment. Looking around the offices of UseAgility, a user design company, it's not hard to believe those numbers. "We just hired a man this summer, but before that we were nine women and took a few jokes that maybe we didn't want to hire a man," says Yana Beranak, managing director of UseAgility. "That wasn't the case. We found that in design there are a lot of women that are really successful and good at it." Beranak sees enough women-founded companies in Kansas City that it doesn't surprise her anymore. But she's been in tech long enough to know how rare that is. "It sounds to me like things aren't ideal for women in some of those situations right now, and I think that's unfortunate," says Beranak. "I don't think it has to be that way. It doesn't feel that way here." Research shows that "second-tier" technology hubs like Kansas City tend to be more appealing to women entrepreneurs. A study done by Virginia Tech found women were attracted to the less-crowded markets as a testing ground. "To start a business here, the cost of entry is not high," says Beranak. "It's just an easy way to get started. You hang out your shingle and if you're good at what you do, you can grow a business." In addition to many women-founded companies, Kansas City has a lot of big tech corporations, like Sprint and Garmin. Yasayuki Motoyama, of the Kauffman Foundation, says being off the coasts means these companies have to look at candidates other places may have ignored. "They can recruit those people and train them," says Motoyama, who has studied second-tier markets. "One to three years later, they'll be excellent." Those training programs can bring more women into tech, particularly if they didn't study it in college. And in a smaller market like Kansas City, huge companies like Cerner have to rely on all the available talent to fill their desks. "Our focus on women in engineering is to provide awareness of our positions, increase our candidate pool of qualified applicants and then, of course, select the best one," says Troy Teague, the senior manager of technical recruiting at Cerner. He thinks other companies are missing out on a great opportunity by not recruiting more women. "Women in engineering could be a driving force in solving the STEM [Science, Technology, Engineering and Math] worker shortage in the United States." But it's not just about getting women in the door. Yana Beranak thinks workplace culture in Kansas City stops women from dropping out of the workforce, even after they have families. "I think that Midwestern 'work hard' gets us the benefit of [saying], 'I'm going to do my work, I'm going to be proud of it, and when I'm done, I'm not going to have to stick around just to put the hours in.'" Which means you can get home in time to pick your kids up from school, or just avoid burning out, two major reasons women leave their jobs. Even with women making up a nearly record 33 percent of the workforce, that leaves 67 percent of the jobs to the guys. A lot of women still find themselves the only double-x chromosome on the team. "A lot of those barriers can make it very easy to get discouraged and want to quit programming all together," says Wadella. "I attribute some of that discouragement to being a woman and to feeling alienated in those situations." Which is why she founded Kansas City Women in Tech. The group allows them to network, vent...and recruit. They're starting these girls young with cupcake websites. Or, perhaps something more interesting, like the app that seventh-grader Emily Stohl developed at a coding camp. "I made an app called Bieber Crush. It crushes Bieber's head." Bad news for Justin Bieber. But great for the next generation of female coders, designers and entrepreneurs to come out of the Silicon Prairie. Last weekend, innovative minds from all over the Kansas City area competed in Kansas City Startup Weekend EDU. More than 22 teams pitched their ideas for improving education through technology, and from those, nine were selected to work with mentors and turn them into real-life applications. 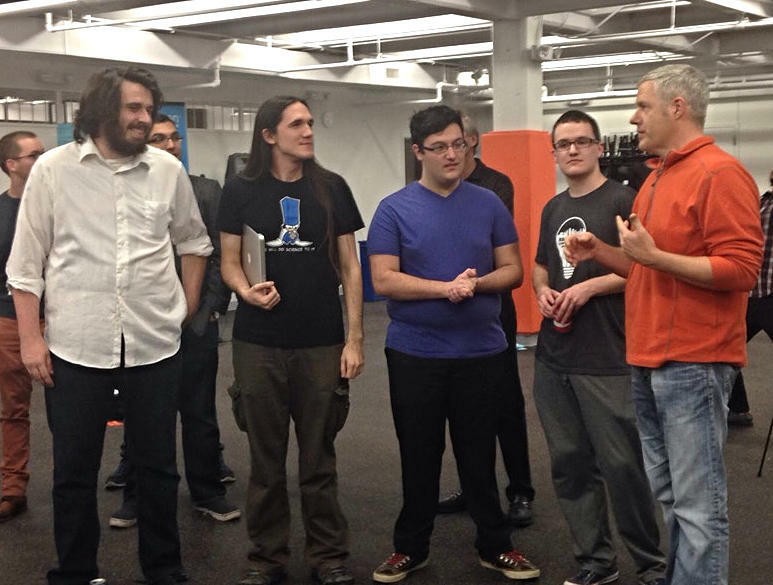 The winning team, MYLearningKC is developing an app that will teach Japanese though a game. Technology is all around us, and it's extending into the fabric of our cities as well. Kansas City, Mo., currently has a letter of intent with Cisco to explore the feasibility of implementing a "smart city" framework. Some are calling Kansas City a potential "laboratory" for the smart city concept. What does that mean, and how can we expect it play out in the day-to-day lives of Kansas Citians?